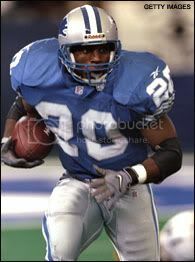 HARD HITTING DETROIT LIONS FORUM - View topic - With LeShoure back, who goes? With LeShoure back, who goes? Now that Mikel LeShoure has completed his suspension and will be part of the 53-man roster, who gets cut to make room for him? Re: With LeShoure back, who goes? ALLEN PARK -- In the season opener against the St. Louis Rams, Detroit Lions running back Joique Bell was a surprise entrant into the game, earning a one-yard touchdown run on his first career carry. Bell carried that momentum into the Lions' second game, having an expanded role as the primary backup to starter Kevin Smith. The Wayne State product finished with six carries for 14 yards and two receptions for 53 more, including a 50-yard screen on 3rd-and-17 on the Lions' final drive of the game. "I was always ready," Bell said. "My coach (Sam Gash) kept telling me I might get a lot of playing time this week, more than I usually do, and I was ready." Bell excelled in the preseason, running for 158 yards on 38 carries and flashing the ability to be a receiving threat out the backfield. That versatility could help him hold on to his roster spot when the Lions activate Mikel Leshoure off the suspended list this week. "It's my job to come out here and play," Bell said. "As far as making decisions on who is on the team and not, that's on the people in the front office. I never get caught up in that. I just came out here and play my game and let the chips fall where they may." Keiland Williams. Joique has proved much more than him so far. Keiland Williams. Has he even played? After yesterday, I'd say it's Keiland Williams. Doesn't really bring anything to the table. With 4 out of every five kick offs being downed in the end zone, it should be Logan IMO. There is no room on the roster for a return specialist anymore. It just doesn't make any sense. I said in pre-season that Bell proved himself to be a better all around back than Williams, and I believe he comes at a cheaper price as well. Keiland Williams is a power back, without that much power. He isn't a great pass blocker and doesn't catch the ball particularly well out of the back field. If the Lions cut Bell, I'll be PISSED! Or maybe...just MAYBE...they'll come to their senses and waive Kellen Moore, then re-sign him to the PS. Last edited by m2karateman on September 17th, 2012, 1:39 pm, edited 1 time in total.